Patti Kadkhodaian is co-founder, along with Wendy Maguire, of the Business Women of Fayette and Coweta (BWFC). The organization has given to a variety of local nonprofits through fundraisers that have generated over $250,000 in donations. When Frank and Patti Kadkhodaian relocated from Chicago to Peachtree City in 1997 with the first three of their four sons, they brought with them deep-seeded family values, a strong work ethic and desire to not just be part of the community, but to give back to a community that supports them. 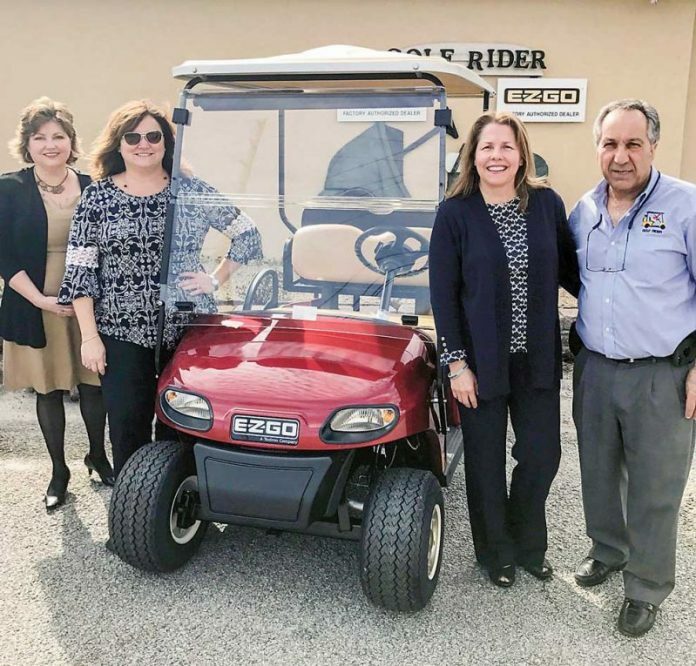 For two decades, the Kadkhodaians have owned and operated Golf Rider, Peachtree City’s only factory authorized dealer and service provider for E-Z-GO and Textron Off Road brand golf carts. As a strong advocate for philanthropy work, the company’s charitable donations support many causes including foster care, education, and cancer care and research. Reinvesting in the community is just one way to reflect the overwhelming generosity and support they’ve received from customers. Golf Rider has contributed to dozens of local groups over the years, including the Real Life Center, the Business Women of Fayette and Coweta, and the Midwest Food Bank. One organization that’s near and dear to Patti’s heart is Bloom, a foster care program based in Fayetteville that’s licensed by the Georgia Department of Human Services and provides hope for kids that might not otherwise have it. The 2017 Bloom Ball raised a record $127,000, thanks in part to a donation by the Kadkhodaians of an $8,000 golf cart, which was raffled off. Previously, they have given two golf carts to the American Cancer Society and many others to Fayette County Schools. Becky Davenport, Bloom Executive Director, says that Golf Rider’s generous Live Auction donation had a tremendous impact on the amount of funds raised to support Bloom’s programs for foster children. “Frank and Patti truly know the meaning of giving back to the community and ultimately their donation provided a path for abandoned, abused, and neglected foster children to obtain the services and resources they need to survive and thrive,” Davenport says. Patti Kadkhodaian is also co-founder, along with Wendy Maguire, of the Business Women of Fayette and Coweta (BWFC). Since incorporating in 2009, BWFC has become a strong and unified group of woman-owned and woman-led businesses. The organization has given to a variety of local nonprofits through fundraisers that have generated over $250,000 in donations. What good is Golf Rider doing now? Through the holiday season, Golf Rider is sponsoring a drive called Wrap Fayette County with Love to benefit the Real Life Center, a local nonprofit that helps families in need connect with vital resources. Donations of new and gently used blankets, towels and bed linens can be dropped off through Christmas at Golf Rider, 100 Huddleston Road, Peachtree City, Monday through Saturday between 8:30 am and 5 pm. For more information about Golf Rider call 770-631-0014 or visit www.golfrider.com.